ANSON — After three-and-half quarters of hard-fought basketball, Bryson Cline jump started a scoring spree to lead the Bulldogs to a 56-44 victory over the Anson Tigers Friday night. From the beginning, the Bulldogs kept a slim lead over the Tigers, but couldn’t break open the game in the first two quarters. By the end of the first, the two teams were even at 11-11 and, as the buzzer sounded for the half, Coahoma had a slight advantage over Anson, 19-17. By the time Cline stepped up to the charity stripe, the Tigers had a one-point lead, 19-20. The Coahoma senior missed his first shot but buried his second to tie the game at 20-20. Ten seconds later, Cline dumped the ball in for two. Then Cline found himself back at the free throw line after being fouled at the post. He drained his two free throws easily. Anson answered at the charity stripe to narrow the deficit down to two, but Cline wasn’t finished. He hit the basket again to up the score 26-22, Coahoma. Then Zack Schneider and Brice Martin jumped in with baskets of their own to widen the Bulldogs lead. By the end of the third, Coahoma was up by eight points, 32-24. Taking over in the fourth, Gaige Hill dumped the ball in at the 7:30 mark. The Coahoma junior added eight points in the fourth alone. Schneider, Cline, Joe Manning, and Kolt Redden added 16 points over the quarter for the Bulldogs. Cline had a game high of 17 points and Schneider added 12 more to lead the Bulldogs to a much needed victory to keep Coahoma in the running for a playoff spot. Next: Coahoma (5-4) hosts the Colorado City Wolves at home. 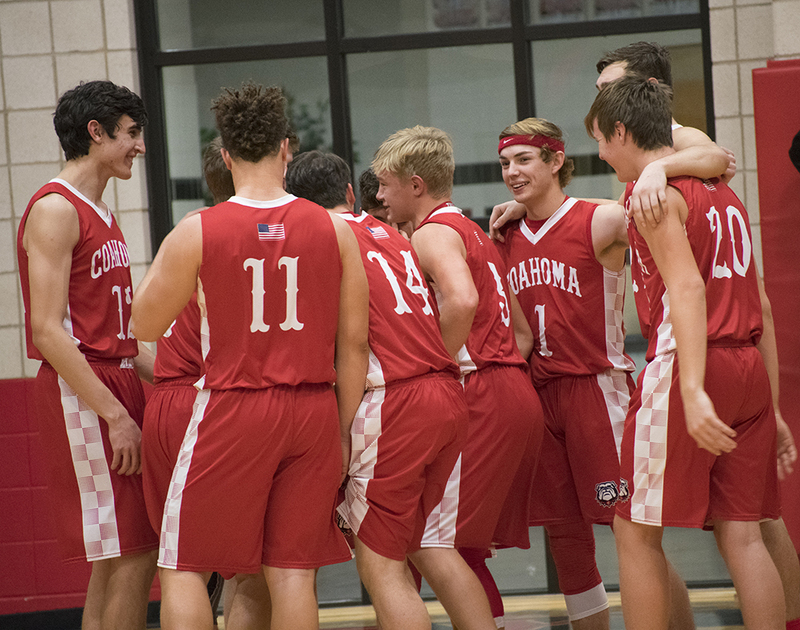 Game time starts at 8 p.m.
Coahoma — Brice Martin 2, Joe Manning 8, Zack Schneider 12, Marcus Martinez 2, Gaige Hill 8, Bryson Cline 17, Kolt Redden 2, Gage Clark-Burdell 5. Anson — D. Pyle 4, W. Fladager 12, D. Rubio 19, J. Garcia 3, M. Hagler 4, K. Villegas 2. Free Throws — Coahoma 12-26, Anson 20-25; Three-Point Goals — Anson 4 (Fladager 2, Rubio, Garcia); Total Team Fouls — Coahoma 24, Anson 18.